When Mark Berning casually mentioned his farm’s breakeven was about $15 per cwt, my ears immediately perked up. A $15 breakeven is pretty good performance in any herd these days. In Berning’s case, it’s even more so. 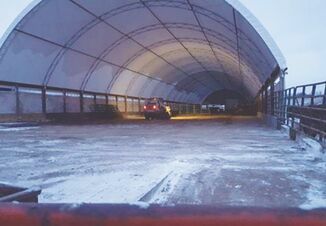 Mark, his brother Paul, and Mark’s son, David, recently doubled the size of their St. Michael, Minn., facility to house 480 cows and milk them with eight robots. The barn is currently about 70 head shy of capacity, but already the Berning trio is seeing benefits. Mark, Paul and a cadre of high-school helpers had been milking about 200 cows in a step-up parlor since 1999. David came back to the operation fulltime in May 2014 after finishing college. That year the Bernings built a crossventilated barn for 240 cows equipped with four Lely automated milkers. 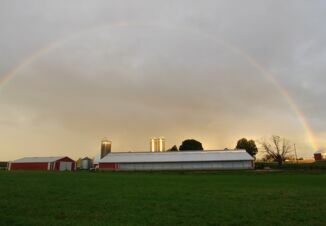 Last year, they doubled the size of the facility, and they started milking in the expanded barn this past spring. 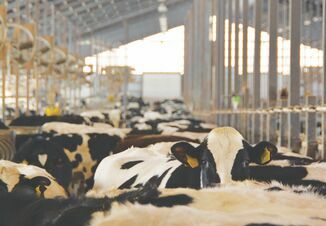 Going to round-the-clock milking, where cows now average about three milkings per day, helped boost production from 72 lb. per cow per day up to 88 lb. to 90 lb. per cow per day. The rolling herd average went from 23,000 lb. per cow to about 27,000 lb. per cow. And that’s with about half the herd as first-calf heifers. Somatic cell counts (SCCs) also dropped in half. “But you have to remember, before the robots we were using a lot of high school help and milking routines were not as consistent,” Mark says. With the robots, SCCs initially dropped to 100,000 cells/mL. They have since crept up to about 145,000 cells/mL, due in part to lower culling as the Bernings build cow numbers. When they doubled the facility, they also changed their washing and prep routine. “That was a mistake, and we were getting more mastitis,” he says. They have since gone back to their original prep routine in hopes of improving milk quality. The one frustration has been components. “We haven’t been able to improve components, with butterfat at 3.5% and protein at 2.99% to 3.1%,” Mark says. But a better than 20% jump in milk production, when half the herd is heifers, is still a remarkable boost in productivity. Corn and corn silage is priced into the budget at market value as are the energy pellets fed through the robotic milkers. The partially-mixed ration the Bernings feed is balanced at 90% of the herd’s production level. Pellets are fed to make up the difference. Each cow receives a different amount of pellets depending on her milk production and stage of lactation. The next highest class of expense is ownership costs. Interest, debt payment and depreciation add up to about $3.48 per cwt, or just under 25% of the total cost of production. Labor is the next largest category— including family salaries and benefits and part-time labor—running about 60¢ per cwt. Part-time labor has dropped dramatically. Prior to the robots, the Bernings were spending $2,000 per week on hired labor to milk 240 cows. Now, with 400 cows, they’re spending about $400 a week for part-time labor. Some of that savings on part-time help comes as the result of David’s return to the operation. Animal health and vet costs have dropped as well. “Displaced abomasums are less than half of what they used to be, and we’ve been able to drop our routine vet visits from once a week to every other week,” Mark says. That’s because activity monitors are picking up health events much more quickly, allowing the Bernings to recognize sick cows faster. The rumination tracking also allows the Bernings to track fresh cows much better. “If ruminations drop, we’ll put them back in the hospital pen where there’s less competition. They spring back a lot faster that way,” Marks says. The new facility itself has led to greater efficiency as well. For example, electrical use is a lot lower with the cross-vent barn ventilation using variable speed fans which operate based on temperature, humidity and wind speed. “The 60 some fans we have now are cheaper to run than the 12 fans we had in the other barn because these older fans would run constantly. The new fans also have much smaller, more efficient motors,” Mark says. Doubling the barn has also led to great efficiency. “Eight robots are a lot more efficient than four,” he says. Management time is spread over that many more cows, and after learning how to read the data, breeding, health and production all improved. But Mark cautions switching to robotic milking is not for everyone. Note: This story appears in the December 2017 magazine issue of Dairy Herd Management.